If you're looking for a great (and cheap!) hotel in Brooklyn, CheapTickets is the best place to find them. We offer deals on the best 146 hotels throughout Brooklyn. No matter what you're looking for, we have options for you. Grab great rates on the 40 affordable 3-star hotels that are easy on the wallet without sacrificing comfort. Looking for more luxury? Try one of the 9, 4-star hotel accommodations in Brooklyn. No matter your budget needs, we've pulled out all the stops to make sure you have plenty of vacation options. Maybe you prefer to search for your hotel deals based on what each hotel offers? For example, let's say you just want to find a hotel or resort that has a pool to cool off in after a long day exploring Brooklyn. Scroll down to choose from the 7 hotels in Brooklyn that has a pool for guests. Or search for deals on Brooklyn hotels offering free wifi or breakfast, non-smoking rooms, and more! CheapTickets is here to be your personal travel agent for your next trip to Brooklyn. Get booking today! What hotels in Brooklyn offer free wifi access? Are there deals on Brooklyn hotels offering free breakfast? Yes! The only thing better than finding a great deal on a cheap hotel in Brooklyn is finding one that offers free breakfast. Grab some eggs, a waffle, or some healthy oatmeal before a day full of exploring Brooklyn and all that it has to offer. Below are just some of the many hotels that offer free breakfast in Brooklyn. 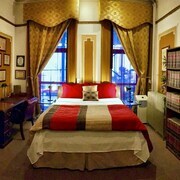 Hotel Le Jolie is a 2.50 star rated hotel property in Brooklyn that offers free breakfast. Green Point YMCA is a 2.00 star rated hotel property in Brooklyn that offers free breakfast. Fairfield Inn & Suites by Marriott New York Brooklyn is a 2.50 star rated hotel property in Brooklyn that offers free breakfast. Days Inn by Wyndham Brooklyn is a 2.00 star rated hotel property in Brooklyn that offers free breakfast. What about deals on pet-friendly hotels in Brooklyn? Brooklyn is a great place to get outside and explore with your pets in tow so don't leave your furry friends behind. Below you'll find great deals on hotels in Brooklyn that allow pets. Don't forget to bring plenty of treats! 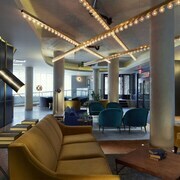 Hotel Indigo BROOKLYN is a popular, pet-friendly, 3.50 star hotel in Brooklyn. Red Lion Inn and Suites Brooklyn is a popular, pet-friendly, 3.50 star hotel in Brooklyn. 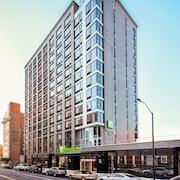 Holiday Inn Express Brooklyn is a popular, pet-friendly, 3.00 star hotel in Brooklyn. 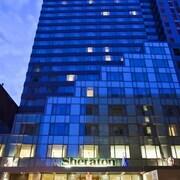 Sheraton Brooklyn New York Hotel is a popular, pet-friendly, 4.00 star hotel in Brooklyn. Any good rates on Brooklyn hotels with restaurants? Absolutely. Don't want to deal with planning our all your meals on your trip to Brooklyn? We don't blame you. Keep the hangry away by staying in one of the 11 hotels that have restaurants. With a room at one of these spots, all it takes to get a good meal is hopping in the elevator. Check out some of the most popular hotels in Brooklyn that have restaurants below. 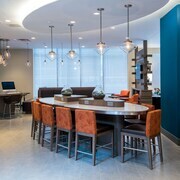 Book The Box House HotelThe Box House Hotel is a 4.00 star hotel and has one or more restaurant options. 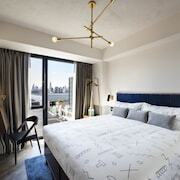 Book EVEN Hotel BrooklynEVEN Hotel Brooklyn is a 4.00 star hotel and has one or more restaurant options. Book Franklin GuesthouseFranklin Guesthouse is a 4.00 star hotel and has one or more restaurant options. Book Wyndham Garden Brooklyn Sunset ParkWyndham Garden Brooklyn Sunset Park is a 4.00 star hotel and has one or more restaurant options. What are the cheapest hotels in Brooklyn with pools? What's better after a long day exploring Brooklyn then a relaxing dip in a pool? Finding the Brooklyn hotel you need for a bargain! Cool off and unwind at one of our 7 Brooklyn hotels with a pool. Browse some of the top deals on these hotels and resorts with pools in Brooklyn below, but be warned: You may not want to check out! New York Marriott at the Brooklyn Bridge has a pool and a 4.00 star rating. Aloft New York Brooklyn has a pool and a 3.00 star rating. McCarren Hotel & Pool has a pool and a 4.00 star rating. Sheraton Brooklyn New York Hotel has a pool and a 4.00 star rating. What hotels in Brooklyn offer parking for guests? Once you've made your way to Brooklyn, the last thing you want to deal with is finding parking close to your hotel. Avoid the hassle of parking around the block and carrying your luggage all the way to the lobby by booking one of our hotels with parking. Check out deals on some of the 52 hotels in Brooklyn that offer parking for guests. 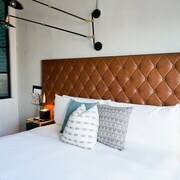 The LOOK Hotel-Red Hook- an Ascend Hotel Collection Member This hotel has a 2.50-star rating. Henry Norman Hotel This hotel has a 3.50-star rating. Hotel BPM - Brooklyn New York This hotel has a 2.00-star rating. La Quinta Inn & Suites Brooklyn Downtown This hotel has a 2.50-star rating. Do Brooklyn hotels offer 24-hour concierge services? When you're on vacation, things don't always go according to plan. Travel with peace of mind when you book one of our 25 hotels in Brooklyn with 24-hour concierge service. That way you know help is always phone call or elevator ride away. Try The Justice Manor. It's a 3.00 star rated hotel in Brooklyn that offers concierge services 24 hours a day. Try Holiday Inn Brooklyn Downtown. It's a 3.50 star rated hotel in Brooklyn that offers concierge services 24 hours a day. Try Brooklyn Way Hotel- BW Premier Collection. It's a 2.50 star rated hotel in Brooklyn that offers concierge services 24 hours a day. Try Wyndham Garden Brooklyn Sunset Park. It's a 4.00 star rated hotel in Brooklyn that offers concierge services 24 hours a day. What about low rates on non-smoking hotels in Brooklyn? Brooklyn Way Hotel- BW Premier Collection This hotel has a 2.50-star rating. Neptune Hotel This hotel has a 2.00-star rating. Brooklyn Motor Inn This hotel has a 2.00-star rating. Pointe Plaza Hotel This hotel has a 3.00-star rating. What are the cheapest Brooklyn 3-star hotel deals? Our 3-star hotels bring you quality accommodations at a lower price point for the perfect, budget-friendly vacation in Brooklyn. With 40 3-star hotels throughout Brooklyn to choose from, you still have options. Browse our selection below. Holiday Inn Brooklyn Downtown. Located in Downtown Brooklyn, this hotel is 0.3 mi (0.4 km) from Brooklyn Academy of Music and within 3 mi (5 km) of Brooklyn Bridge and New York Stock Exchange. Battery Park and Federal Reserve Bank of New York are also within 3 mi (5 km). Holiday Inn Express Brooklyn. Located in Park Slope, this hotel is 0.7 mi (1.2 km) from Barclays Center Brooklyn and 2.3 mi (3.7 km) from Brooklyn Bridge. Brooklyn Academy of Music and Brooklyn Public Library are also within 1 mi (2 km). The Tillary Hotel. Located in Downtown Brooklyn, this hotel is within 1 mi (2 km) of St. Ann's Warehouse and Brooklyn Bridge. New York University and New York Stock Exchange are also within 3 mi (5 km). Condor Hotel. Situated in Williamsburg, this hotel is close to Brooklyn Academy of Music, Brooklyn Bridge, Federal Reserve Bank of New York, and several subway stations. Area attractions also include New York Stock Exchange and New York University. What are the best deals on 4-Star Hotels in Brooklyn? Brooklyn is full of hotels and it can be hard to narrow down where you really want to stay. Luckily, we've done that hard work for you be narrowing you from 146 hotels throughout Brooklyn, to the 9 4-star hotels in Brooklyn. Our 4-star hotels in Brooklyn are exactly what you need for your next family trip, romantic weekend, or solo getaway. Check out our most popular deals below. Sheraton Brooklyn New York Hotel: Situated in the city center, this hotel is close to Brooklyn Academy of Music, Brooklyn Bridge, and Ellis Island. Area attractions also include Federal Reserve Bank of New York and New York Stock Exchange. New York Marriott at the Brooklyn Bridge: Standing at the end of the Brooklyn Bridge&#39;s ramp, the Marriott is 1 block from the Borough Hall subway stop, with Manhattan a 10-minute ride away; the Brooklyn Heights Promenade is a half-mile stroll. Wyndham Garden Brooklyn Sunset Park: Situated in Brooklyn, this hotel is within 3 mi (5 km) of Barclays Center Brooklyn, Brooklyn Public Library, and Grand Army Plaza. Brooklyn Cruise Terminal and Fort Hamilton Triangle are also within 3 mi (5 km). 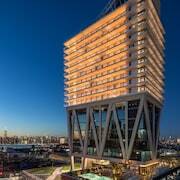 The Box House Hotel: Located in Greenpoint, this aparthotel is within 1 mi (2 km) of MoMA PS1, 5 Pointz The Institute of Higher Burnin, and Gantry Plaza State Park. 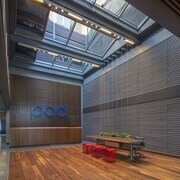 P.S.1 Contemporary Art Center and SculptureCenter are also within 1 mi (2 km). What are the best activities to do in Brooklyn? Medieval Times Dinner & Tournament: Starting at just $68 per person. Indoor Skydiving Experience: Starting at just $90 per person. What are the most popular attractions in Brooklyn? People travel to Brooklyn from all around to witness the incredible sights and attractions. With 40 sights to see during your stay, you're sure to have a busy trip in Brooklyn. Below, we've listed some of our favorites. Overall we had an excellent stay. JOSSIE in the front desk was outstanding. Did not look 👀 for a negative. Every thing was find. Look forward till next time. Other people staying there were partying until 4 a.m. walking around in boots and talking loudly. The Hotel is great, but unless they care about restricting inconsiderate guests and enforcing quiet hours, it's a wash.
Hotel and accommodation was nice, safe and clean. But be cautious if you forget any stuff of yours. Take it as soon as you can, as you can't rely on cleaning persons. Rest everything was fine.